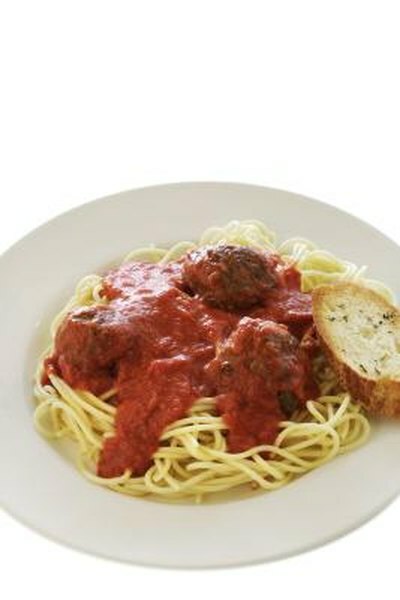 Tomato sauce is a popular accompaniment to many meals, but it is also one of the prime culprits in heartburn flareups. The high acidity of the tangy sauce can cause people pain after a hearty Italian dinner. However, there are ways to make your tomato sauce less acidic and keep yourself, and your loved ones, safe from digestive outbreaks. Cut your cooking time. Many chefs pride themselves on crafting sauces that simmer for hours until they are, in the eyes of their preparers, perfect. However, letting a tomato sauce simmer all day before you pour it over your spaghetti makes it more acidic. The longer the sauce cooks, the more concentrated it becomes, as more moisture leaves the broth. This leaves you and your family with a very acidic sauce. According to chef Nancy Schneider, the sauce should cook no longer than 1 1/2 hours. Add sugar. Many home Italian cooks add a few dashes of white or brown sugar to their tomato sauce to cut the acidity of the tangy red sauce. According to The Epicurean Table, the amount of sugar will change with each pot of sauce you create, because each batch of tomatoes has a slightly different taste and acidity. Add it 1/2 tsp. at a time when the sauce is almost finished. It should be enough to cut the acidity of the sauce but not so much that the sauce tastes sweet. Toss sugar-rich vegetables into your sauce instead of table sugar if you are trying to create a more healthful dish. A few handfuls of carrots in your simmering sauce will have the same effect as the sugar. As the carrots soften in the sauce, they release natural sugar into your sauce and lower the acidity. Epicurean Table: Tomato Puree and Sauce - too acidic for you?